Another lovely sunny day and a fine walk. These days we aren't averse to using whatever means there may be in order to gain a bit of early height. Nick impressed us yesterday with his tale of staying overnight at the top of the Gornergrat railway so that he and Daniella could watch the sunrise from over 3000 metres. 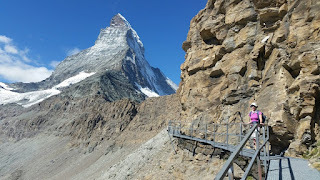 Today we simply caught the 'Matterhorn Express', a gondola ride, from Zermatt to Schwarzee, via Furi. 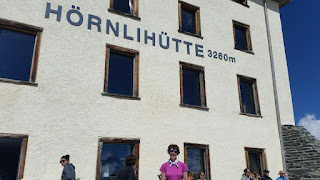 Then an easy climb of 700 metres past some cute sheep took us to the sunny terrace outside Hörnlihütte. 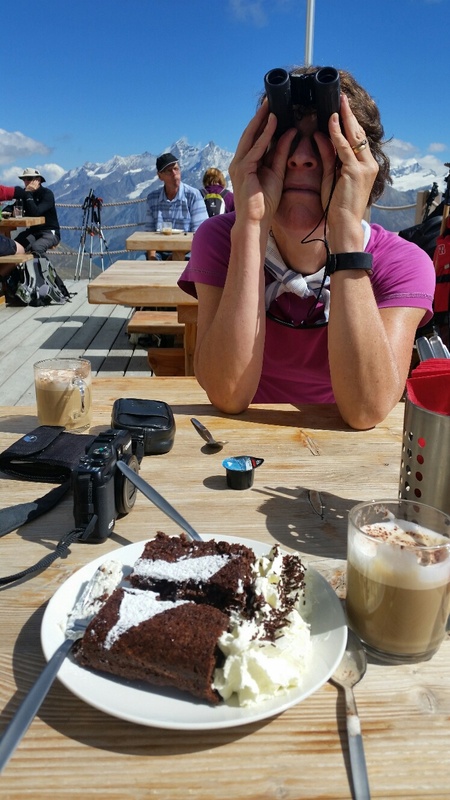 We enjoyed coffee and cake with a German couple from near Nuremberg whilst studying the route taken by climbers up the Matterhorn. There were plenty of people on it in today's superb conditions. 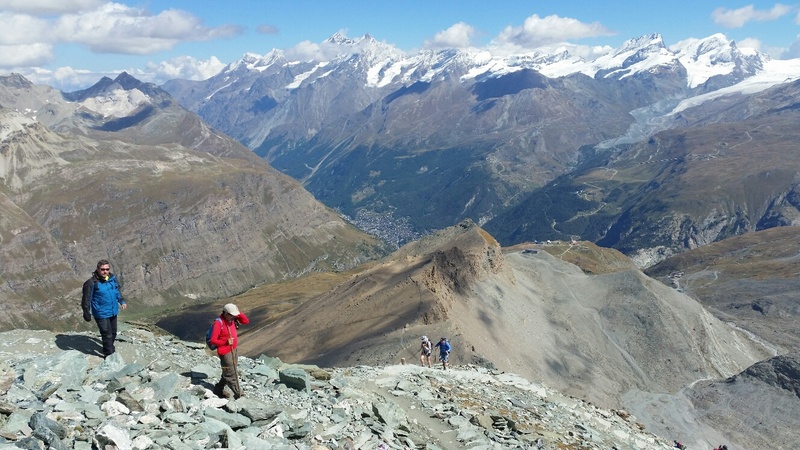 After a sharp initial descent, we left the throngs to return to Schwarzee and their easy trip back to Zermatt. Having accomplished today's 'Project 1949' tasks, we took a path to the left (north) that led eventually to Stafel and an easy valley path back to Zermatt via a dam crossing and the hamlet of Zmutt. 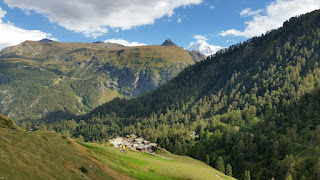 It was great to be able to enjoy lunch in a deserted meadow with fine views to the summit of the Matterhorn and to numerous other peaks that litter the horizon in all directions hereabouts. There was just a handful of other walkers about, some of whom we later discovered had come this way from Schwarzee by mistake, and a few mountain bikers. After stopping for a while to finish our tea and biscuits just above Zmutt, we continued our amble back to Zermatt, past fields full of Autumn Crocuses, and past a bench on which the unmistakable form of John Burt was perched. John is a stalwart of the TGO Challenge, having completed that backpack across Scotland some 18 times. I first met him on the 2007 Challenge (my first) in a restaurant in Drumnadrochit. He was covered in tick bites. Today he was covered in smiles. It was good to know that his tiresome feet had recovered from May's backpacking stresses. We spent a good half hour with John, and will see him again tomorrow. We had just about enough time to cook and consume our dinner, master the intricacies of the house's laundry facilities, and catch up with admin, before adjourning to the basement cinema for the weekly showing of Josef's amateur film of the local wildlife over the period of a year, featuring eagles, ibex, chamois, black grouse lecking, foxes, ptarmigan, snow finches, a plethora of flora, and much more. All set to Vivaldi's Four Seasons. It was lovely, despite being narrated in German. Well done Josef. Were taken on the ascent to Hörnlihütte, at Hörnlihütte, and finally above Zmutt, from our tea and cake break. 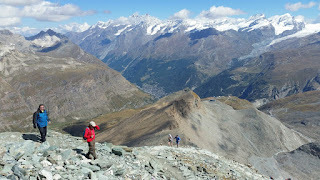 You can see the Breithorn, 4159 metres, on that bottom picture. I've been up it! Looks like a good overdose of chocolate on this trip. Super photos! Bringing back happy memories of the Roberts' trip to Zermatt. Actually, not as much chocolate as when I'm at home! More apfelstrudel though. Thanks for your comments. Sadly the perfect weather couldn't continue, but it's still much better than last weekend. Kulmhotel looks fine to me, Nick.